Did you know that 1 in 6 children in the United States face hunger? 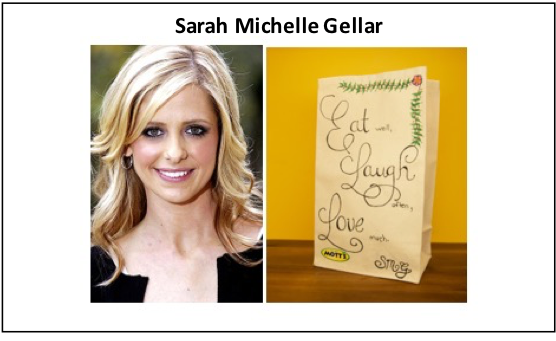 That’s why Sarah Michelle Gellar teamed up with Mott’s and No Kid Hungry to design a one-of-a-kind lunch bag now available for auction on eBay to raise money and awareness for No Kid Hungry, a campaign to end childhood hunger in America by national nonprofit Share Our Strength. From now until September 29, you can head over to ebay.com/usr/nokidhungry to place a bid on this unique masterpiece, 100 percent of the proceeds will go directly to No Kid Hungry! Did you know that 1 in 6 children in the United States face hunger? @NoKidHungry and @Motts teamed up with celebrities to draw attention to child hunger. Head over to eBay to bid on six different celebrity-designed lunch bags! These unique works of art will go to the highest bidder and all proceeds will go directly towards changing lives! A $1 donation can help provide 10 meals for children in need.